On May 1st, we will welcome our 5th writer-in-residence, since helping to save Joy Kogawa’s childhood home from impending demolition – A house that was “confiscated” from her family and sold, while her family was locked away in an internment camp for “Enemy Aliens” during WW2. Joy was six years old at the time, and had been born in Canada. No Japanese-Canadians were ever charged with a crime. I think that our four writers previously: John Asfour (Montreal), Nancy Lee (Richmond), Susan Crean (Toronto), Deborah Willis (Victoria), have all brought social issues to the forefront. They have shared their stories, the work of other writers, and have also assisted writers. TORONTO, April 30, 2013 /CNW/ – Kurdish Iranian author Ava Homa , a PEN Canada Writer-in-Exile, has been chosen as the next writer-in-residence at Vancouver’s Historic Joy Kogawa House. Homa’s three-month residency, funded by the Canada Council Residency Program and the British Columbia Arts Council, will begin on May 1, 2013, and focus on writing, research and community programs. The Historic Joy Kogawa House Society is a community-based arts group that supports a writer-in-residence on a volunteer basis. Set in the former home of the author Joy Kogawa , the program seeks to foster a wider appreciation of Canadian literature within the communities of Metropolitan Vancouver. Homa will supervise creative writing workshops, consult with emerging writers and use the time to complete a novel about immigration, displacement and culture shock – themes germane to the fiction of Joy Kogawa and to the mandate of the Historic Joy Kogawa House Society. Born and educated in Iran, Ava Homa holds an MA in English Language and Literature from the University of Tehran and an MA in Creative Writing from the University of Windsor. In 2010 TSAR Publications published her debut collection of short stories, Echoes from the Other Land, which was subsequently chosen as one of ten People’s Choice finalists in the 2011 Canada Reads competition. PEN Canada is a nonpartisan organization of writers that works with others to defend freedom of expression as a basic human right, at home and abroad. PEN Canada promotes literature, fights censorship, helps free persecuted writers from prison, and assists writers living in exile in Canada. PEN Canada’s Writers in Exile program helps authors and journalists who have been silenced in their country of origin to establish themselves in Canada. Historic Joy Kogawa House is situated in the former home of the Canadian author Joy Kogawa (born 1935), where she lived until age six. It stands as a cultural and historical reminder of the expropriation of property that all Canadians of Japanese descent experienced after the bombing of Pearl Harbor in 1941. Between 2003 and 2006, a grassroots committee fundraised in a well-publicized national campaign and, with the help of The Land Conservancy of BC, a non-profit land trust, managed to purchase the house in 2006. This entry was posted in Joy Kogawa & Kogawa House, Literary Events and tagged Ava Homa, Kogawa House, PEN, writer-in-residence on April 30, 2013 by admin. More than 50 seniors attended the AGM of the Head Tax Families Society of Canada, held Saturday April 20 at the Chinese Cultural Centre of Greater Vancouver. Many spoke in Cantonese, as they are the surviving sons and daughters of the original head tax payers who came to Canada before the Chinese Exclusion Act banned immigration. Some were born in Canada, but many had been born in China, and were separated by the Exclusion Act until after 1947, when the Act was repealed, and families could be reunited. Several of the seniors came up to me to say hello, commenting they hadn’t seen me for awhile. Standing with my friends for a just and honourable redress. I am a descendant of 3 generations of head tax payers: My maternal great grandfather Ernest Lee, my grandfather Sunny Mar, and my paternal grandmother Wong Sze. Come see “Naomi’s Road” opera – based on Joy Kogawa’s famous award winning book “Obasan” and it’s children’s novel counterpart. Only 45 minutes + short talk & Q&A with survivors of Japanese & Italian Canadian internment camps, Mr. Akira Horii and Mr. Ray Culos. An important part of Canadian history – if you have read Obasan, and watched “Bomb Girls” on tv. Coffee & desserts served following. I loved the Naomi’s Road opera when I first saw it in October 2005, and the following four times I saw it again at West Vancouver Library, Vancouver Public Library, Japanese Language School, and Nikkei Centre. Naomi’s Road cast came for a visit to Historic Joy Kogawa House on Thursday. They were delighted to see the home and cherry tree where the characters of Naomi and Stephen grew up. Myself, and fellow Kogawa House board members Deb and Joan, join the cast + pianist + stage manager. L-R, Todd, Deb, Baritone Henry Chen, Soprano Hiather Darnel-Kadonaga, “Joy”, Mezzo-Soprano Erica Iris, pianist Candy Siu, stage manager Melania Radelicki, Joan, and tenor Sam Chung. 35 people from Vancouver Opera came to Kogawa House including graphic designers, set builders, publicist, finance officer, and representatives from the volunteer Opera Guild. General Manager James Wright, who had originally came up with the idea of turning the children’s novel Naomi’s Road into an opera. He shared the story about reading Great Canadian Books of the Century by Vancouver Public Library, and being inspired by the synopsis/review about Joy Kogawa’s novel Obasan. I shared how in September 2005, that Ann-Marie Metten had called me with the information that a demolition permit had been applied for for 1450 West 64th Ave, the address of Kogawa House. At the time, Naomi’s Road opera was just about to launch, and the Vancouver Public Library was just wrapping up its One Book One Vancouver program that featured the novel Obasan, and Asian Canadian Writers’ Workshop was awarding its Community Builder Award to Joy. 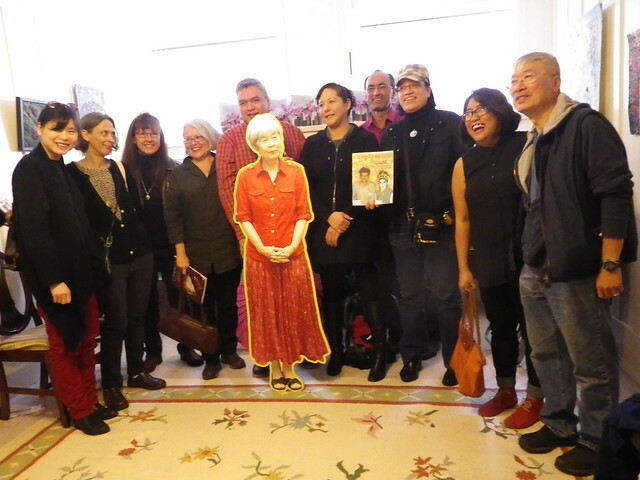 It was an amazing intersection of celebrations of Joy Kogawa’s works, and it all helped to draw attention to saving Historic Joy Kogawa House from possible demolition. It is indeed amazing how things come full circle. I have now met 6 doctors in 7 days regarding the ulcer on my right cornea + talked to another on the phone on Sunday. Today I met Dr. Joe and he is a former competitive dragon boater! And I also met Dr. Anderson, whom I think is the senior ophthamologist. And… Dr. Silver checked me out again too! This entry was posted in Todd Wong and tagged eye, ulcer on April 18, 2013 by admin. 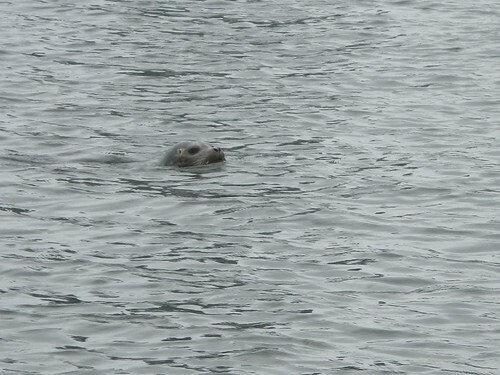 Today, we saw a big harbour seal lazily swimming on the water in front of our dragon boat in False Creek, just off David Lam Park. I called “let it ride” and the paddlers stopped paddling, and I softly said “Quiet” to the team… as the boat glided quietly… right past the seal… until it was 5 feet away from the boat… When our mid boat reached it, it slowly swam away on the surface… to about 20 feet distance… then dived. 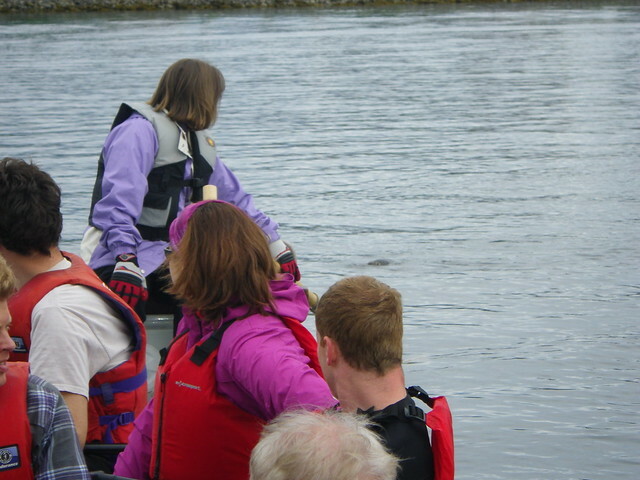 It must have been sleeping on the surface… The closest and longest look, I have seen a habour seal from a dragon boat in 20 years of paddling. Ugh… I have an ulcer on my cornea. It is kind of crazy that I saw 3 different doctors today. I spent much of the afternoon and evenings visiting my GP office at 2pm, LGH Emergency at 4:30pm, then at the VGH Eyecare Clinic at 8pm. The above picture is from August 2009 when I had a corneal abrasion – thought possibly due to sand/grit from hanging out at Kalmalka Beach in Vernon, during a wind storm. My regular doctor was all booked up so I saw her office partner Dr. Yam. After putting some dye on my eye, she thought I might have a “tear” on my cornea, so she sent me to emergency. At Lion’s Gate Hospital, I saw Dr. Andolfatto, who confirmed there was something wrong on my eye, and made an 8pm appointment for me to go to the Eye Clinic at VGH, where I saw Dr. Silver who made the final diagnosis. Nice to know we have a great healthcare system that can set me up with an ophthalmologist at 8pm on a Friday night. Well.. if it was a stomach ulcer… I wouldn’t be able to drink any alcohol. But since I have an eye patch, and the ulcer is on my eye… I can have a shot of Captain Morgan for every drop of anti-biotics that I put in my eye… which is each hour. This entry was posted in Todd Wong and tagged cornea, eye, ulcer on April 12, 2013 by admin. I have just become the “Guardian” of four boxes of accordion sheet music that belonged to my former accordion teacher… what a treasure trove of sheet music! lots of Accordion band arrangements… such as Bach’s Fugue in Dm. I love getting in touch with “my inner opera orchestra”… great to have new-to-me accordion sheet music… trying out overtures to William Tell and Barber of Seville – by Rossini, and Italian in Algiers reminds me of when our friend Randal Jakobsh played Mustafah in the Vancouver Opera’s version of “Italian Girl in Algiers” – I will have to learn to play it for him.